On average, there are over 6 million car accidents on road in the United States each year. Following a car accident, many people suffer from whiplash-associated disorder (WAD). 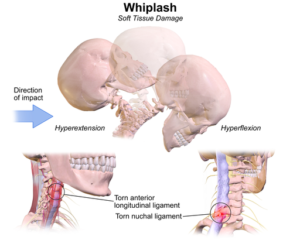 Whiplash occurs when there are bony and soft tissue injuries to the neck caused by a rapid acceleration of the head and neck followed by a rapid deceleration. This happens most often during a car accident. The Quebec Task Force has authored 5 studies evaluating the best treatment for the different stages of whiplash. The stages consist of the acute stage in the first 2 weeks, the sub-acute stage in weeks 2-12, and the chronic stage 12 weeks or more. All of the studies found that immobilization with a soft collar was detrimental to short and long-term recovery. For acute whiplash injuries, studies showed that exercise programs significantly reduced pain intensity over the short and medium term compared to immobilization. Mobilization, especially with active therapies such as joint mobilization and soft tissue and trigger point treatments, also helped reduce pain intensity and may also improve range of motion. Adding supervised exercise treatment early after injury for sub-acute whiplash injuries is superior to later unsupervised treatment. An aggressive exercise program, however, is detrimental during the sub-acute stage. Cervical (neck) and thoracic (upper and mid back) joint manipulation showed short term improvement in cervical range of motion and pain reduction. While more research is needed, the existing research shows that exercise programs are effective at reducing pain in patients with chronic whiplash symptoms. Manual joint manipulation by a chiropractor was shown to reduce whiplash-related disability as well. Limited evidence has shown that myofeedback training can be beneficial for chronic whiplash patients. Exercise programs were shown to be the most effective for chronic whiplash. Teasell RW, McClure JA, Walton D, et al. A research synthesis of therapeutic interventions for whiplash-associated disorder: Part 1 – overview and summary. Pain Research & Management : The Journal of the Canadian Pain Society. 2010;15(5):287-294. Teasell, Robert W et al. “A Research Synthesis of Therapeutic Interventions for Whiplash-Associated Disorder (WAD): Part 2 – Interventions for Acute WAD.” Pain Research & Management : The Journal of the Canadian Pain Society 15.5 (2010): 295–304. Print. Teasell RW, McClure JA, Walton D, et al. A research synthesis of therapeutic interventions for whiplash-associated disorder (WAD): Part 3 – interventions for subacute WAD. Pain Research & Management : The Journal of the Canadian Pain Society. 2010;15(5):305-312. Teasell RW, McClure JA, Walton D, et al. A research synthesis of therapeutic interventions for whiplash-associated disorder (WAD): Part 4 – noninvasive interventions for chronic WAD. Pain Research & Management : The Journal of the Canadian Pain Society. 2010;15(5):313-322. Teasell RW, McClure JA, Walton D, et al. A research synthesis of therapeutic interventions for whiplash-associated disorder (WAD): Part 5 – surgical and injection-based interventions for chronic WAD. Pain Research & Management : The Journal of the Canadian Pain Society. 2010;15(5):323-334. For more information on auto injury related statistics click here.